You are practical, observant, fun-loving, spontaneous risk-takers with an excellent ability to quickly improvise an innovative solution to a problem. You're enthusiastic and fun to be with, and are great motivators. You has a tremendous love for life. You're flexible, adaptable, genuinely interested in people, and usually kind-hearted. You love to be the center of attention and perform for people, You're generally cheerful and almost always in a good mood. You are a person to process life through your experiences. It is the ability to be keen to what is seen, smelled, touched, heard and tasted. It is energized by experience and it is able to live "in the moment." 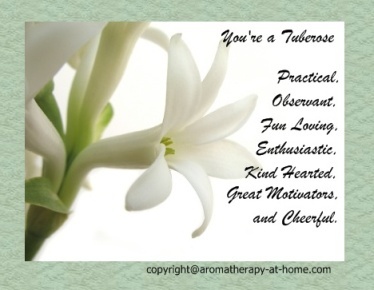 You can use Tuberose essential oils (Polianthes tuberose) for these positive attributes : motivated, enthusiastic, encouraged, sensuous, spontaneous, expressive. And to counteract these negative attributes : stress, jealousy, disorientation, confusion, resentment.